Background: Defense and protection to multiple harmful stimuli are the inflammation, when is self-amplified and uncontrolled is the basis of the pathogenesis of a wide variety of inflammatory illness. The aim of this study was to evaluate if Petiveria alliacea could attenuate inflammation in a murine model of RAW264 macrophages the involved model and its involved mechanism. Materials and Methods: The ethanol extract from P. alliacea was precipitated with water and supernatant was used for this study (PW). The anti-inflammatory effects of PW were investigated through evaluating of the production of several cytokines, chemokines, and expression of nuclear factor-kappa B (NF-κB) in lipopolysaccharide (LPS)-stimulated RAW264.7 macrophages. Also was determined the ability to decrease the oxidative stress in RAW264.7 cells with carboxy-2',7'-dichloro-dihydro-fluorescein diacetate. Results: PW significantly suppress the secretion of prostaglandin E2, leukotriene C4, interleukin (IL)-1 β, IL-6, IL-10, interferon gamma nitric oxide (NO), inducible NO synthase, IL-1 β, IL-4, in RAW264.7 cells in a dose-dependent manner. In addition, PW also markedly inhibited the transcriptional activity of NF-κB. PW produced significant anti-inflammatory activity through inhibiting the production of inflammatory mediators through the NF-κB inactivation in the LPS-stimulated RAW24.7 cells. Conclusions: PW exerts significant antioxidant and anti-inflammatory activities, and this effect can be attributed in part, to the presence of dibenzyl disulfide, dibenzyl trisulfide pinitol, coumarin, myricetin, glutamyl-S-benzyl cysteine, and petiveriins A and B.
Abbreviations used: COX-2: Ciclooxigenasa 2; DCFHDA: Carboxy-2',7'-dichloro-dihydro-fluorescein diacetate; DMEM: Dulbecco's modified eagle's medium; FBS: Fetal bovine serum; HSP70: Heat shock protein; IFN-γ: Interferon gamma; IL-1 β: Interleukin 1 β, IL-6: Interleukin 6; IL-10: Interleukin 10; IL-4: Interleukin 4; iNOS: Nitric oxide synthase; KCl: Potassium chloride; LPS: Lipopolysaccharides; LTC4: leukotriene C 4; MgCl2: Magnesium chloride; MTT: 3-(4,5-dimethyl-thiazol-2-yl)-2,5-diphenyl-tetrazolium bromide; NF-κB: Nuclear factor kappa-light-chain-enhancer of activated B-cells or transcriptional activity of nuclear factor-kB; NO: Nitric oxide; PBS: Phosphate-buffered saline; PGE2: Prostaglandin E2, PMSF: Phenylmethylsulfonyl fluoride; PTC: Chloroform extract from Petiveria alliacea; PE: Ethanol extract from Petiveria alliacea; PTH: Hexane extract from Petiveria alliacea; PW: Supernatant of PTE precipitated with water; RAW264.7: Cell line murine macrophages; ROS: Reactive oxygen species; TNF-α: Tumor necrosis factor. Treatment with ethanol extract from Petiveria alliacea which was previously precipitated with water and supernatant (PE) was tested in LPS-stimulated RAW264.7 cells. PE suppressed the level of oxidative stress and the induction of proinflammatory mediators, as PGE2, LTC4, IL-1 ß, IL-6, IL-10, IFN- NO, iNOS, IL-1 ß, IL-4, in RAW264.7 macrophages through NF-B inactivation. These findings suggest that P. alliacea affords promising therapeutic in inflammatory diseases. The inflammation is considered to be a major risk factor in the pathogenesis of chronic diseases where the macrophages are important immune cells which regulate inflammation producing expression of inflammatory proteins and pro-inflammatory chemokines, cytokines, and nitric oxide (NO). Macrophages are highly sensitive to initiators of inflammation as lipopolysaccharide (LPS) which respond by the release of mediators such as interleukins (ILs) IL-2, IL-4, lL-6, IL-10, and IL-1 β and cytokines interferon gamma (IFN-γ), NO, inducible NO synthase (iNOS), and inducing the inflammatory gene expression where each is associated somehow with the pathophysiological of the inflammation. Proinflammatory activity is prolonged in the development of chronic inflammation, such as psoriasis, inflammatory bowel diseases, rheumatoid arthritis, and refractory asthma. Hence, modulation of macrophage activation is a good strategy to prevent this diseases. Thereby, anti-inflammatory compounds with the ability to reduce the production of pro-inflammatory markers are an efficient way to control inflammatory diseases. Petiveria alliacea L. (Phytolaccaceae) is used in folk medicine as a stimulant, anticancer, antimicrobial, anti-inflammatory and to combat asthma among many others. Lately have been reported a large number of sulfur-containing compounds ,,,, among them S-propyl propanethiosulfinate and S-benzyl phenylmethanethiosulfinate possess antioxidant activity. In addition, P. alliacea exerts antifungal and antibacterial activities. Antiinflammatory effect has been studied in rats with pleurisy. In another study in vitro P. alliacea can induce apoptosis and down-regulate HSP70 expression. Nuclear factor-kappa B (NF-κB) activity and levels of tumor necrosis factor (TNF)-α were investigated by Schmidt et al. The aim of this study was determined whether P. alliacea could suppress LPS-induced inflammation in RAW264.7 macrophage, and its involved signal pathway wound healing. All reagents were purchased from Sigma (St. Louis, MO, USA). Penicillin, fetal bovine serum (FBS), Dulbecco's modified eagle's minimum essential medium (DMEM), and streptomycin were purchased from Life Technologies Inc. (Grand Island, NY, USA). Bacterial LPS of Escherichia coli, 0127: B8 (LPS) was purchased from Calbiochem Co. (San Diego CA, USA). The enzyme immunoassay (EIA) kit for TNF-α, IL-6, IL-1 β was obtained from R&D Systems (Minneapolis, MN, USA). Assay for cytokines was obtained from Santa Cruz Biotechnology Inc.(Santa Cruz, CA, USA). Enzyme-linked immunosorbent for the assay of prostaglandin E2 (PGE2) and leukotriene C4 (LTC4) was obtained by Cayman Chemical Co. (USA). Leaves of P. alliacea L. (Phytolaccaceae) were collected from Bahia de Banderas about 70 km of Puerto Vallarta. The plant was authenticated by Biologist Aurora Chimal, and a voucher specimen (No. 5943) was deposited at the Herbarium of Universidad Autonoma Metropolitana-Xochimilco, Mexico. The plant material was air-dried in the shade at room temperature and ground into powder (1 kg). Extraction was performed in Soxhlet apparatus with ethanol for 3 h and then the solvent was evaporated until half volume. An equal volume of water was added while heating on 60°C and placed on refrigerator for 24 h. The precipitated material was discarded, and supernatant was used for this study (PW). The RAW 264.7 murine macrophage was obtained from the American Type Culture Collection (Bethesda, MD, USA). Cells were cultured in DMEM supplemented with 10% of FBS, streptomycin (100 μg/ml), and penicillin (100 units/ml) incubated overnight at 37°C and 5% CO2. RAW 264.7 macrophages were seeded in 96-well plates at density of 1 × 104 cells/well and 3-(4,5-dimethyl-thiazol-2-yl)-2,5-diphenyl-tetrazolium bromide (MTT) assay was performed to measure the cell viability. Briefly, the cells were washed with PBS and incubated (Thermo Scientific, Waltham, MA, USA) with PE to concentrations of 50, 100, and 200 μg/ml at 37°C and 5% CO2. Then, 10 μl of MTT (5 mg/ml) was added to phosphate buffer followed by further incubation for 4 h at 37°C. After supernatant removal from wells, 100 μl, of buffer was added for dissolution of formazan crystals. The absorbance of each well was then read at 570 nm using an ELISA plate reader. A decrease in absorbance values indicated a reduction in cell viability. The nitrite accumulated in culture medium stimulated by endotoxin LPS (1 μg/ml) was measured as an indicator of NO production based on the Griess reaction (0.1% N-1-naphtyl ethylenediamine dihydrochloride, 1% sulfanilamide in 5% (v/v) phosphoric acid in distilled water) with or without the test extract, and the absorbance of the resulting solution was measured at 540 nm with a spectrophotometer ultraviolet-1800, Shimadzu. In all experiments, fresh culture medium was used as the blank. The amount of nitrite production in the samples was measured using a standard calibration curves prepared with a sodium nitrite serial dilution. Furthermore, RAW 264.7 cells were washed three times with cold PBS and centrifuged for 10 min at ×500 g min at 4°C. The cell pellet thus obtained was resuspended in 0.5 ml Tris-buffer (40 mM, pH 8.0) containing 1 μg/ml chymostatin, 5 μg/ml of pepstatin A, 100 μM phenylmethylsulfonyl fluoride and 5 μg/ml aprotinin and then lysed by two freeze-thaw cycles. Aliquots of the lysate were used for the analysis of iNOS. To evaluate the effects of PE in RAW264.7 macrophages, these were first cultured in the absence or presence of LPS at a final concentration of 1 μg/ml in DMEM medium and incubated at 37°C in humified 5%CO atmosphere for 12 h. The cultured cells in the plate were eluted with 0.5 mol/L NaCl) were selected for bioassay using washed three times with 1 ml of sterile PBS. One milliliter of sample of different concentrations at 50, 100, and 200 μg/ml were then incubated for another 12 h. Interleukin 6 (IL-6), 10 (IL-10), and cyclooxygenase (COX)-2 protein expressions, in culture supernatants using a commercial ELISA assay kit (R and D Systcms Inc., Minneapolis, MN, USA). IFN-γ levels were determined using a commercial ELlSA Quantikine kit (H and D Systems). Levels of tumor necrosis factor-α (TNF-α) were quantified using a Quantikine ELlSA kit (R and D Systems). PGE2 levels were quantified using a kit for prostaglandin E2 (PGE2) (MyBioSource, San Diego, CA, USA), following manufacturer instructions. LTC4 was determined using an ELISA kit (MyBioSource, San Diego, CA, USA). IL-1 β was measured to Thermo Fisher Scientific (Waltham, MA, USA). Aminoguanidine (4 μg/ml) and celecoxib (20 μg/ml) were used as positive controls. The intracellular accumulation of reactive oxygen species (ROS) in the RAW264.7 macrophages was determined with carboxy-2',7'-dichloro-dihydro-fluorescein diacetate (DCFHDA) method. Cells RAW264.7 were plated in 35-mm culture dishes at 5.0 × /104 cells/cm 2. Then, the medium is changed with a new one. Cells seeded on 96-well/plates were incubated with DCFHDA probe for 40 min. At the end of this period, medium was removed and cells exposed to the extract under investigation at a concentration to 50, 100, and 200 μg/ml. After incubating exposed cells at 37°C for 24 h, fluorescence was measured at 488 nm (excitation) and 535 nm (emission) wavelengths on a microplate reader (Molecular Devices Spectra MAX Gemini X). To evaluate activation of the NF-κB transcription factor in cells were performed in RAW264.7 macrophages (5 × 106 cells) were incubated with LPS or alone plus the test samples for 1 h, and the cells were collected. Extract was aggregated a collected cells in 0.1 ml of a hypotonic buffer (10 mM Tris-HCl, pH 7.8, 0.3 mM ethylene glycol tetraacetic acid, 5 mM magnesium chloride, 1 mM dithiothreitol, 10 mM potassium chloride, and 0.1 mM PMSF a protease inhibitors), 15 min then added 25 ml 0.5% Nonidet P-40. The mixture was incubated for 30 min in a plate coated with an oligonucleotide that corresponded to the transcription factor consensus site. Activation of the NF-κB transcription factor was measured using a Transcription Factor NF-κB (p50) ELISA Kit (Abcam, Cambridge, UK) according to the manufacturer's instructions. Values of the data were expressed as the means ± standard error of mean. Statistical analyses were performed with SPSS software, version 17.0 (SPSS, Inc., Chicago, IL, USA). Statistical significance was assessed by ANOVA followed by Tukey test. P < 0.05 was considered statistically significant. Analyzing the results of the extracts of hexane (PTH), chloroform (PTC), and ethanol from P. alliacea were found that the ethanol extract has the maximum antiinflammatory activity, thus other extracts data not presented here. Structures of metabolites present in P. alliacea, have been extensively studied. The previous reports have shown that the ethanol extract partitioned with water (PW) contains dibenzyl disulfide, dibenzyl trisulfide pinitol, coumarin, benzaldehyde, petiveral, leridol, myricetin, petiveral 4-ethyl, petiveriins A and B, and some others organosulfur compounds mainly produced by degradation of benzyl sulfoxides during the plant extraction process, as petiverins, thiobenzaldehyde and S-oxide, S-(2-hydroxi ethyl)-phenylmetane-thiosulfinate, glutamyl-S-benzyl cysteine which inhibit NO production, dibenzyl trisulfide which acting as an immunomodulatory. In previous studies was found that compounds such as pinitol, coumarin  myricitrin (a flavonoid glycoside) have been reported to have anti-inflammatory effects. These substances found as secondary metabolites may be involved in anti-inflammatory mechanisms. To evaluate the effect of PW on viability of RAW 264.7, murine macrophage was conducted in the MTT assay. 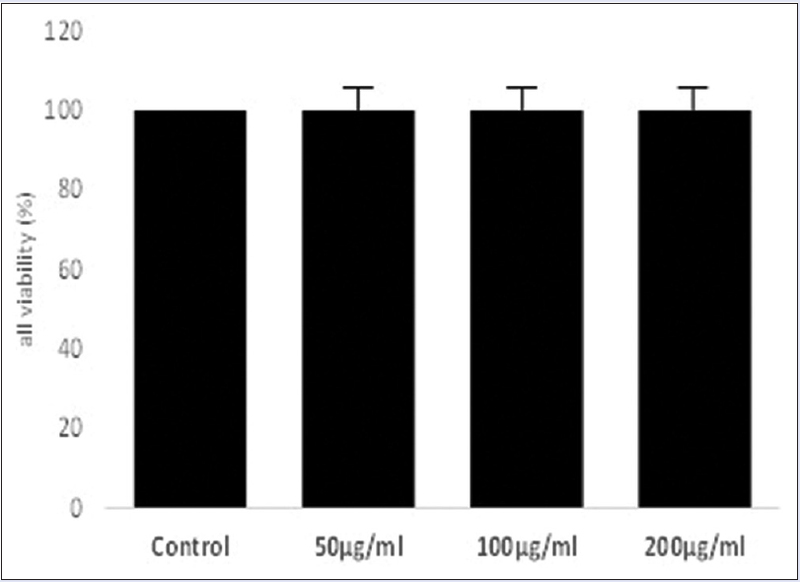 As shown in the [Figure 1] found no significantly (P < 0.05) difference in the cell viability when were treated at the concentrations of 50, 100, and 200 μg/ml. Therefore, these concentrations were selected to conduct the study of the anti-inflammatory effect. The current study was carried out to determine the anti-inflammatory effect of the ethanol extract of P. alliacea semi-purified (partitioned with water) on RAW264.7 murine macrophages. The chemical composition of the more effective fraction PW was determined in the previous studies. Exposure of RAW 264.7 cells to LPS increased NO concentration of a level of 7.51 μM to 24.29 μM. NO inhibitory activities by treatment with PW at dose of 50, 100, and 200 μg/ml were 57.26%, 61.05%, and 67.55%, respectively, indicating that a concentration of 200 μg/ml possessed the highest NO inhibitory activity [Table 1]. NO inhibitory activity of PW is higher compared to the effect of indomethacin used as positive control. The inhibition of NO can occur due to modulation of cellular inflammatory pathways, or direct scavenging suggested that the sulfhydryl group of cysteine of the diastereoisomers of S-benzylcysteine sulfoxide as petiveriins A and B previously identified in P. alliacea can react with NO to form an S-nitrosothiol adduct. To investigate whether PW can modulate iNOS expression, analysis was conducted in LPS-stimulated RAW264.7 macrophages. As indicated [Table 1], iNOS expression was increased by treatment with LPS alone compared to without LPS group, nevertheless, with treatment of PW produced a lowering of levels iNOS. The observed inhibition was dose-dependent, and at dose of 200 μg/ml PW inhibited 65% expression of iNOS. iNOS is implicated in the synthesis of prostaglandin H2 starting of arachidonic acid, which is a precursor of PGE2, in activated macrophages with LPS. In addition, iNOS leads to overproduction of NO, PGE2, and COX-2 which results in the production of inflammatory diseases. Thus, modulation of iNOS and NO expressions could be one of the strategies to reduce inflammatory diseases. As shown in [Table 1], LPS-stimulated RAW264.7 macrophages led to release of proinflammatory lipid mediators PGE2 and LTC4. PW at dose of 200 μg/ml showed a significant inhibitory effect on release of the prostaglandin PGE2 and LTC4 with values of 73.17% and 42.79%, respectively [Table 1]. This pro-inflammatory can improve inactivated immune cells, including mast cells enhanced the antiallergic activity. In this study, we used a commercial transcription factor ELISA kit to evaluate whether PW modulated activation of NF-κB in LPS-stimulated RAW264.7 cells. As shown in [Table 1], LPS induced the activation of NF-κB in RAW264.7 cells, whereas PW markedly suppressed this LPS-induced NF-κB activation in a concentration-dependent manner. The previous reports have shown that extracts of P. alliacea exhibited wound healing due to the effect on NF-κB and TNF-α activities; however, no effect has been detected on LPS-induced inflammation in RAW 264.7 cells. LPS activates several intracellular signaling pathways, including NF-κB transcription factor involved in the transactivation of a variety of genes associated with inflammatory responses and regulating immune. These results indicated that PW downregulated the LPS-induced NF-κB signaling pathway in a concentration-dependent manner revealing that inhibit the production of proinflammatory cytokines by suppressing NF-κB activation. ELlSA assay was used to determine the effects of PW on levels of TNF-a, IFN-γ, IL-2, IL-4, lL-6, IL-10, and IL-1 β in LPS-stimulated RAW 264.7 macrophages. Secretion of these pro-inflammatory mediators compared with the untreated control cells after LPS-stimulated for 24 h the RAW 264.7 cell was strongly increased. As indicated [Table 2], PW sígnificantly (P < 0.05) reduced the production of these cytokines in a dose-dependent manner. The inhibitory activities with 200 μg/ml of PW treatment was 37.39% for TNF-a, 52.68% for IFN-γ, 60.29% for IL-2, 59.42% for IL-4, 50.70% for lL-6, 59.57% for IL-10, and 60.29% for IL-1 β. However, only the cytokines IL-4 and IL-10 returning to the basal level of the untreated group. TNF-α in inflammation processes is an essential pro-inflammatory mediator, which can lead to other inflammatory molecules expression as IL-6, and COX-2. Psoriasis, refractory asthma, inflammatory bowel disease, and rheumatoid arthritis, can be caused TNF-a interact with its receptors to trigger downstream activation of inflammatory gene expression. However, IL-10 is a potent anti-inflammatory cytokine which has immunomodulatory effects, causing the inhibition of other pro-inflammatory cytokine as TNF-α. The secretion of pro-inflammatory mediators is an important factor in upregulating inflammatory processes. Therefore, the development of anti-inflammatory substances, which can modulate the production of pro-inflammatory mediators, are an efficient way to manage inflammatory conditions. It is well known that concentrations of palmitate at 500 μm increase oxidative stress, stimulate ROS production in RAW264.7 cell. H2O2 model has been used to determine the oxidative stress due it can generate in vivo by enzymatic dismutation/or the spontaneous the superoxide anion radical. Pretreatment with flavonoids for 1 h at 20 μM significantly decreased ROS production prevent oxidative stress in RAW264.7 cell and palmitate-induced ROS production using DCFH-HA (for H2O2−) and DHE (for O2−) test. The oxidative stress reduction potential of PW is given [Table 3]. The capacity of 50, 100, and 200 μg/ml of PW to reduce the oxidative stress was compared with that of 25 μg/ml of ascorbic acid. The values of the mean fluorescent intensity indicated that PW significantly reduced palmitate induced increases in ROS-cells. Some pathways of inflammation operate through oxidative stress, acting as scavenging agents or acting on redox state of the cell and other acting as scavenging agents. The capacity of PW to decrease the oxidative stress in cells can be possibly due to their ability to act as free radical scavengers, quenchers of singlet O2 formation, to complex with prooxidant metal ions and reducing agents. These results agree with those reported previously. The present study has demonstrated that PW from P. alliaceae exhibited anti-inflammatory action in LPS-stimulated RAW264.7 macrophages through modulation of pro-inflammatory mediators. Modulation effects are attributed to its inhibition of inflammatory gene expressions through blocking of NF-κB signaling pathways. This work was supported by National Polytechnic Institute through of Direction of postgraduate studies and research (code 20160207). This work was supported by National Polytechnic Institute. Abarikwu SO. Kolaviron, a natural flavonoid from the seeds of Garcinia kola , reduces LPS-induced inflammation in macrophages by combined inhibition of IL-6 secretion, and inflammatory transcription factors, ERK1/2, NF-kB, p38, Akt, p-c-JUN and JNK. Biochim Biophys Acta 2014;1840:2373-81. Benevides PJ, Young MC, Giesbrecht AM, Roque NF, Bolzani VS. Antifungal polysulphides from Petiveria alliacea L. Phytochemistry 2001;57:743-7. Kubec R, Musah RA. Cysteine sulfoxide derivatives in Petiveria alliacea . Phytochemistry 2001;58:981-5. Kubec R, Kim S, Musah RA. S-substituted cysteine derivatives and thiosulfinate formation in Petiveria alliacea -part II. Phytochemistry 2002;61:675-80. Kubec R, Musah RA. Gamma-glutamyl dipeptides in Petiveria alliacea . Phytochemistry 2005;66:2494-7. Kim S, Kubec R, Musah RA. Antibacterial and antifungal activity of sulfur-containing compounds from Petiveria alliacea L. J Ethnopharmacol 2006;104:188-92. Okada Y, Tanaka K, Sato E, Okajima H. Antioxidant activity of the new thiosulfinate derivative, S-benzyl phenylmethanethiosulfinate, from Petiveria alliacea L. Org Biomol Chem 2008;6:1097-102. Lopes-Martins RA, Pegoraro DH, Woisky R, Penna SC, Sertié JA. The anti-inflammatory and analgesic effects of a crude extract of Petiveria alliacea L. (Phytolaccaceae). Phytomedicine 2002;9:245-8. Cifuentes MA, Castañeda DM, Urueña CP, Fiorentino S. A fraction from Petiveria alliacea induces apoptosis via a mitochondria-dependent pathway and regulates HSP70 expression. Univ Sci 2009;14:125-34. Schmidt C, Fronza M, Goettert M, Geller F, Luik S, Flores EM, et al. Biological studies on Brazilian plants used in wound healing. J Ethnopharmacol 2009;122:523-32. Kim MJ, Yoo YC, Sung NY, Lee J, Park SR, Shon EJ, et al. Anti-inflammatory effects of Liriope platyphylla in LPS-stimulated macrophages and endotoxemic mice. Am J Chin Med 2016;44:1127-43. Huang S, Liu HF, Quan X, Jin Y, Xuan G, An RB, et al . Rhamnella gilgitica attenuates inflammatory responses in LPS-Induced murine macrophages and complete Freund's adjuvant-induced arthritis aats. Am J Chin Med 2016;44:1379-92. Choi EY, Lee SS, Hyeon JY, Choe SH, Keum BR, Lim JM, et al . Effects of β-glucan on the release of nitric oxide by macrophages stimulated with lipopolysaccharide. Asian Australas J Anim Sci 2016;29:1664-74. Aranda A, Sequedo L, Tolosa L, Quintas G, Burello E, Castell JV, et al. Dichloro-dihydro-fluorescein diacetate (DCFH-DA) assay: A quantitative method for oxidative stress assessment of nanoparticle-treated cells. Toxicol In Vitro 2013;27:954-63. Ling XQ, Wang JK. Techniques for assaying the activity of transcription factor NF-kB. Yi Chuan 2013;35:551-70. Kubec R, Kim S, Musah RA. The lachrymatory principle of Petiveria alliacea . Phytochemistry 2003;63:37-40. William LA, The TL, Gardner MT, Fletcher CK, Naravane A, Gibbs N, et al . Immunomodulatory activities of Petiveria alliacea L. Phytother Res 1997;11:251-3. Singh RK, Pandey BL, Tripathi M, Pandey VB. Anti-inflammatory effect of (+)-pinitol. Fitoterapia 2001;72:168-70. Shimizu M, Shogawa H, Matsuzawa T, Yonezawa S, Hayashi T, Arisawa M, et al. Anti-inflammatory constituents of topically applied crude drugs. IV. Constituents and anti-inflammatory effect of Paraguayan crude drug “alhucema” (Lavandula latifolia Vill.). Chem Pharm Bull (Tokyo) 1990;38:2283-4. Winekenstädde D, Angelis A, Waltenberger B, Schwaiger S, Tchoumtchoua J, König S, et al. Phytochemical profile of the aerial parts of Sedum sediforme and anti-inflammatory activity of myricitrin. Nat Prod Commun 2015;10:83-8. Wink DA, Nims RW, Darbyshire JF, Christodoulou D, Hanbauer I, Cox GW, et al. Reaction kinetics for nitrosation of cysteine and glutathione in aerobic nitric oxide solutions at neutral pH. Insights into the fate and physiological effects of intermediates generated in the NO/O2 reaction. Chem Res Toxicol 1994;7:519-25. Smith C, Swart AC. Rooibos (Aspalathus linearis) facilitates an anti-inflammatory state, modulating IL-6 and IL-10 while not inhibiting the acute glucocorticoid response to a mild novel stressor in vivo. J Functional Foods 2016;27:42–54. Lian J, Cheng B, Gao Y, Xue H, Wang L, Wang M, Yang H, Feng Z, Protective effect of kaempferol, a flavonoid widely present in varieties of edible plants, on IL-1β-induced inflammatory response via inhibiting MAPK, Akt, and NF-κB signalling in SW982 cells. J Functional Foods 2016; 7: 214-222. Cho M, Yang C, Kim SM, You S. Molecular characterization and biological activities of watersoluble sulfated polysaccharides from Enteromorpha prolifera . Food Sci Biotechnol 2010;19:525-33. Shawish HB, Wong WY, Wong YL, Loh SW, Looi CY, Hassandarvish P, et al. Nickel (II) complex of polyhydroxybenzaldehyde N4-thiosemicarbazone exhibits anti-inflammatory activity by inhibiting NF-kB transactivation. PLoS One 2014;9:e100933. Sundaram S, Shanthi P, Sachdananda P. Tangeretin, a polymethoxylated flavone, modulates lipid homeostasis and decreases oxidative stress by inhibiting NF-κB activation and proinflammatory cytokines in cardiac tissue of streptozotocin-induced diabetic rats. J Functional Foods 2015;10:315-33.